Class of 2021 left-handed hitting right side Jordan Iliff has committed to the University of Missouri women’s volleyball program. Iliff will be a sophomore this upcoming season at Mehlville High School in Missouri. As a freshman she started as an opposite and setter, appearing in 71 sets. In total she logged 298 assists (4.2 per set), 187 kills (2.6 per set) on a .321 hitting percentage, 210 digs (3.0 per set), 44 blocks (0.6 per set) and 31 aces (0.4 per set). Those numbers gave her team-highs in assists while she was second in aces, blocks and kills. Standing at 6’1″, Iliff plays with Rockwood Thunder Volleyball Club, recently the Rockwood Thunder 15 Mizuno team. With the squad she was athe leader in kills as they collected a 13th place finish in the Open Division at Nationals. She was also on the first-team for 15s Club Volleyball All-Americans from PrepVolleyball. 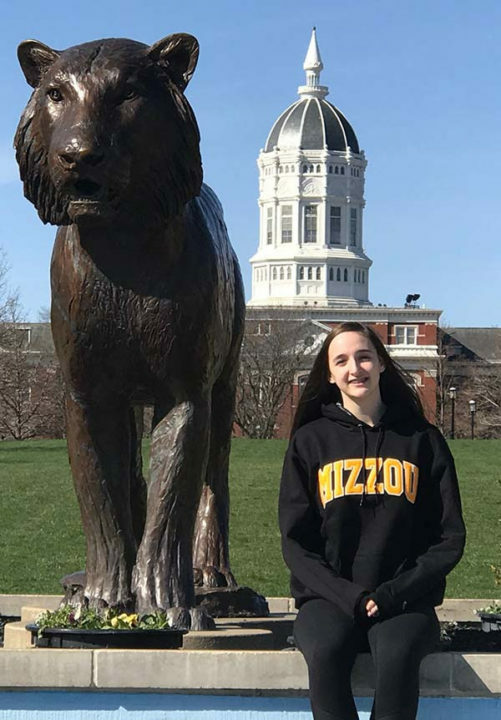 It’s not the first future recruit for Missouri into the 2020’s, as class of 2020 defensive specialist/libero Emily Brown is also committed to the school. Additionally, Brown’s class of 2021 teammate at Rockwood Thunder VBC, Addison Lyon, plans on joining the Tigers. The Tigers 2018 season begins on August 24 against Delaware State before weekend meetings with Fairfield and James Madison. Missouri finished 2017 at 22-12 overall and 13-5 as a member of the Southeastern Conference (SEC) before making the Sweet 16/Regional Semifinals of the NCAA Tournament.